Figure 5.21 An ice skater being pushed by two other ice skaters. This is College Physics Answers with Shaun Dychko. This skater in the middle is being pushed by two other skaters with the forces shown. 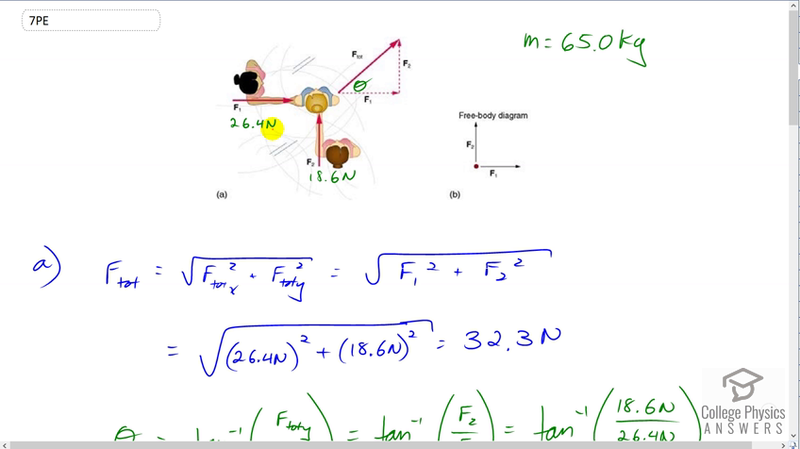 We have 26.4 Newtons to the right and 18.6 Newtons upwards and this results in a total force exerted on the skater being F subscript tot for total. That is not the net force though because this question also asks us to consider friction. But the first thing we’re gonna do is figure out what this total force is and then in part b, we’ll say that friction is acting in the opposite direction to the total force on the object, or the opposite direction to what it’s motion is or would be. So the friction is going to be exactly in the opposite direction to Ftot. But let’s figure out what the Ftot is first. We’re conveniently given two forces that are at right angles with each other, so that means the x and y components of this total force are the forces given, F1 and F2. The Ftot is going to be the Pythagorean sum of F1 and F2, so that’s the square root of F1 squared plus F2 squared, and so that’s the square root of 26.4 Newtons squared plus 18.6 Newtons squared, giving us 32.3 Newtons. The direction of this force theta is going to be the inverse tangent of the opposite divided by the adjacent, so it’s the inverse tangent of F2 over F1, so that’s the inverse tangent of 18.6 divided by 26.4 which is 35.2 degrees. So the total force vector is 32.3 Newtons, 35.2 degrees above the positive x-axis. This is the positive x-axis here, and this angle is above that axis. And I wrote this little arrow here to say that what we’re talking about here is a vector, it’s not just a magnitude, it’s something that has a magnitude and a direction. Now in part b, we’re told that the skater is initially not moving which means the friction that’s in play here is the static friction. And so the net force is going to be the total force applied by the other skaters minus the friction force going in the opposite direction, and that friction force will be the coefficient of static friction which is why I have a letter s as a subscript there, multiplied by the normal force between the skater and the ice, and the normal force is going to equal the skater’s weight mg. So then we plug in numbers, so that’s 32.294 Newtons which is the unrounded version of that to avoid intermediate rounding error, minus 0.04 which is the coefficient of static friction for steel on ice, you can find that in Table 5.1, multiplied by 65 kilograms times 9.8 Newtons per kilogram, and that is 6.814 Newtons. Now this net force also is mass times acceleration, that’s Newton’s second law. We’ll divide both sides by m, to get the acceleration is net force divided by m. So that’s 6.814 Newtons divided by 65 kilograms which is 0.105 meters per second squared, and that’ll be in the direction of the total force applied by the other two skaters. Then in part c, it’s basically the same question because the same forces are applied except that the friction is now kinetic friction which is always less than static friction because in part c the skater is now moving. So the coefficient of kinetic friction for steel on ice is 0.02. That’s the number we plug in here, which is the same formula as up here but we have 0.02 instead of 0.04, so that works out to 19.554 Newtons is the net force, and we divide that by 65 kilograms, that gives 0.301 meters per second squared, also in the direction of the total applied force. Also, because she is initially stationary doesn't that mean she is not moving. Meaning that her acceleration would be zero? Hi marievillafuerte, thanks for the question. It's possible there's a typo in your edition of the text. Perhaps you're using an older printed version? I'm seeing 0.04 in the pdf downloaded from https://openstax.org/details/books/college-physics-ap-courses. Also, we expect a much lower coefficient for steel on ice since, from experience skating, the coefficient of static friction should be very small since it's really slippery standing on ice with skates on. 0.40 is a coefficient comparable to wood on wood (0.50), which is not slippery. Also, https://www.engineeringtoolbox.com/friction-coefficients-d_778.html gives a steel on ice static friction coefficient of 0.03. The skater moves as a result of being pushed by other skaters so, while she does begin from rest, she will be accelerated by the push from her two fellow skaters. Hi! i am also seeing that the text book provides a value of .4 rather than .04. I am using the most current edition of theOpenstax book found online. Hi alexgoble, thanks for the comment. 0.04 is definitely the best estimate for the coefficient of static friction for steel on ice. Some editions of the OpenStax text list 0.40 in table 5.1, as you've noticed. I'm using revision number "CPFAC-2015-002(03/17)-BW", which is the latest high res. version of the College Physics for AP Courses. Perhaps the regular "College Physics" text not intended for AP courses has an outdated table? In any case, 0.40 is an error, which can be verified by considering other data sources such as https://www.engineeringtoolbox.com/friction-coefficients-d_778.html. Thanks again for mentioning it though, since getting feedback from students with sharp eyes helps make College Physics Answers the best resource it can be.